BRANDON, MB – Researchers from Brandon University (BU) are collaborating with one of Mexico’s most significant universities to help guide sustainable, ecologically friendly growth at a favourite tourist destination. 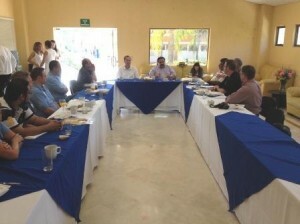 In February, a BU team travelled to Puerto Vallarta as part of a unique collaborative partnership with Universidad De Guadalajara, researching increased visitation to the area including emerging opportunities and challenges for whale-watching tours and historic churches. Dr. Eberts was joined by Dr. Daniel Olsen and Dr. Chris Malcolm from BU’s Department of Geography. “Whale-watching is a booming sector of the local tourist trade,” says Dr. Malcolm, “as the waters off Puerto Vallarta are an important breeding ground for humpback whales. 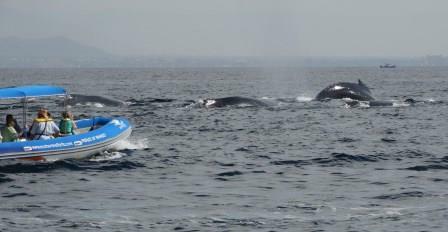 We are studying whether tourists are gaining a better knowledge of marine conservation through their whale-watching experience, an important take-away which has never been fully assessed. Robert Moore, a BU Geography (Environmental Studies Concentration) Major, made the trip to assist in Dr. Malcolm’s research, and a student from Universidad De Guadalajara also lent a hand in surveying whale-watching tour operators and clients. As a result, Dr. Malcolm has agreed to supervise the Mexican student’s upcoming thesis project. The current research is funded through the Social Sciences and Humanities Research Council (SSHRC) Aid to Small Universities program, which enables small postsecondary institutions in Canada to develop and/or strengthen research capacity and collaboration in a particular area of the social sciences and humanities.